Today the Arabic news channel Al-Jazeera broadcast a program about the death of the Palestinian leader Yasser Arafat. The program claimed that in- depth investigation reveals high levels of radioactive polonium were found in Arafat’s personal belongings eight years after his death. 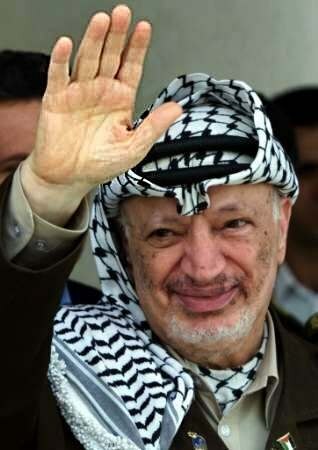 Arafat was a leader and a father for his people who fought hard for the rights of the Palestinians. Many would be interested to know “the truth” about his death. If Arafat was indeed murdered, it would indirectly incriminate his inner circle more than anyone else (Israel). Many opponents of the Palestinian Authority (PA) are already blaming the PA for not properly investigatingArafat’s death. If polonium was in Arafat‘s remains, why didn’t it contaminate all his friends and guards who used to hug and kiss him daily? Exhuming the body after eight years would be highly unlikely to prove anything, as the radioactivity would probably be difficult to detect and would not prove much. Arafat died at the age of 75. He was frail and weak following his confinement by Israel in his Ramallah compound for two years before his death, a confinement which severely weakened his leadership and his influence in the Palestinian territories. The rise of Hamas and other Palestinian militant groups had compounded the damage. Politically he was finished, even before his mysterious death. Also, let’s not forget that in 2007, following Hamas’ take-over of Gaza, Hamas-affiliated militiamen and gangsters blew up the main entrance to his house in Gaza and stole all his files, gifts he had received from world leaders and even his military uniforms. Even his pictures of him with his daughters were taken. It also crucial not to ignore the fact that the current power struggle between Fatah and Hamas has reached a new level. Yesterday Hamas suspended the work of the Central Electoral Commission, a day before it was due to start updating the electoral rolls in Gaza. On the other hand, Hamas accused Fatah of escalating the detentions of Hamas members in the Fatah-run West Bank, the effect of which was that Hamas affiliates could not register to vote, or hold party meetings to prepare for the elections. In another development, last Saturday, the Palestinian Authority’s security forces ruthless crushed a demonstration in Ramallah against a planned meeting between Abbas and Israeli deputy PM Shaul Mofaz. This reckless behaviour overshadowed a very important question: If the Palestinians reject any open-channels with the Israelis, then what’s next? I am not sure what exactly Al Jazeera was after and if it had an ulterior motives for its nine month long– mostly meaningless- investigation, and I don’t want to speculate. Still wonder, why now? Yes, it would be interesting to know how Arafat died. However, it is far more crucial for the pro-Arab-Spring channel to move on from the past and focus on the future. What about promoting Palestinian unity for change? These rivalries and divisions are a political luxury that Palestinians cannot afford. The Arab world is in the post revolution era (Syria will hopefully join soon). This era needs a new strategy and progressive coverage from news channels. So in summery, please Al-Jazeera move away from conspiracy theories. Enough! This entry was posted in Palestine and tagged Arafat Hamas Fatah al-Jazeera. Bookmark the permalink. A very interesting post, Nervana. Thanks for your perspective in the discussion.